It is impossible to be part of an organization today and not attend meetings. Staff meetings, project meetings, task force meetings, planning and coordinating meetings…..the list is endless. The worst thing about many of these meetings is that they’re poorly run and waste valuable time. Today, there’s been a growing recognition that effective meetings happen when proper attention has been paid to the process elements and when proceedings are skillfully facilitated. We are now spending so much time in meetings and being asked to achieve so many important goals in teams that there’s a growing need for skilled facilitation throughout our organizations and our communities. Facilitation is fast becoming a core competency for anyone who leads a team, manages a project, heads up a committee, or manages a department. To get the most from people today, leaders have to know how to create buy-in, generate participation, and empower people. To keep pace, today’s leaders need to be coaches, mentors, and teachers. At the core of each of these new roles is the skill of facilitation and this pocket guide is your essential resource for this expertise. Understanding Facilitation – Manage the process not the content. Use language of facilitation. Understand best and worst facilitation practices. Effective Questioning – What to ask, why, how and how might people respond. Question types, question formats, question bank, and question pointers. Facilitation Stages – Assessment and Design. Feedback and Refinement. Final Preparation. Starting a facilitation, during a facilitation, and ending a facilitation. Follow up. Who Can Facilitate – Internal vs. External. Meeting Leadership. Facilitation strategies for leaders. Role challenges and facilitating colleagues. Knowing Your Participants – Conducting an assessment. Group assessments. Comparing teams to groups. Getting a group to act like a team. Creating Participation – Anticipate Potential Barriers. Create the conditions for full participation. Clarify topics, create buy-in and identify organizational support. Effective Decision Making – Traits of effective decision making. The four types of conversations. The four levels of empowerment. Decision making paradigms, options, poor decisions and things to watch for. Facilitating Conflict – Comparing and facilitating arguments and debates. Steps in managing conflict. The five conflict options. Preventing conflict. Interventions. Dealing with resistance. Common pitfalls. Meeting Management – Meetings that work. Our meetings are terrible. Meeting behaviors symptoms and cures. Meeting process notes. Balancing meeting roles. Status Update meetings. Meeting surveys. Virtual meetings. Meeting best practices. Process Tools For Facilitators – Appreciative review, visioning, gap analysis, decision grid, troubleshooting, exit survey, needs and offers dialogue, and gallery walk. Meeting Design Template – Steps in meeting design, potential pitfalls, meeting components. The new innovative chapter on the Art of Questioning helps facilitators identify the right questions to ask in a wide variety of situations. It contains a unique Question Bank with over 150 tried and tested questions that will help with all kinds of situations, such as establishing parameters, behavioral norms, expectations, uncovering issues, creative thinking, resistance to change, commitment, clarity, perspective etc. The chapters on Decision Making and Conflict Management have had major updates to add important new techniques. 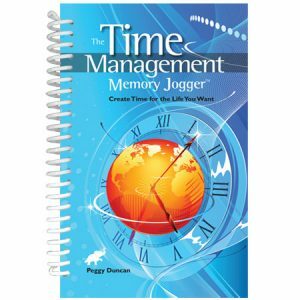 The chapter on Meeting Management now features process notes for the all important Status Update Meeting and “at a glance” charts describing facilitator best practices, before, at the start, during, and at the end of every meeting. 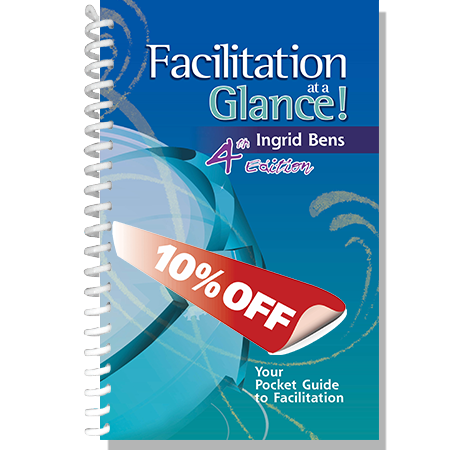 Ingrid Bens, the author, is a nationally known consultant/trainer, and continues to enlighten us with an updated and comprehensive view of the role of the facilitator and the essential core practices of facilitation and meeting management that are always in play. 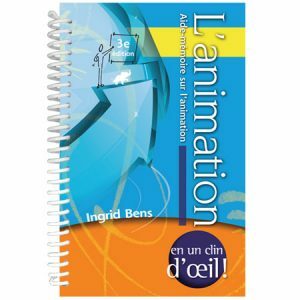 With this new edition, Facilitation at a Glance! 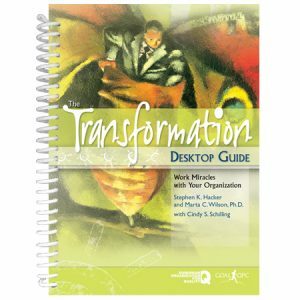 increases its importance as a must-have resource for anyone who plans meetings or leads teams. 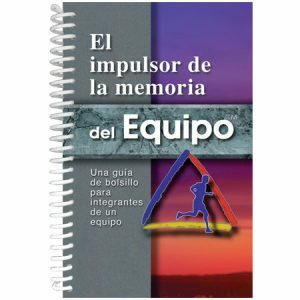 Author of Teachable Moments of Leadership.